Colle di San Domenico Campo Regio Relais v Siena, Itálie: Zarezervujte nyní! Its distinction is that it opens up to one of the most breathtaking views of the city in which the windows and the terraces reflect the ambient surroundings. 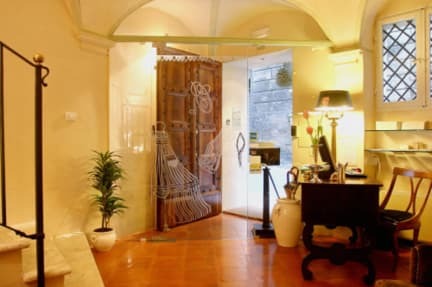 Campo Regio Relais can be found on Via della Sapienza, one of the main streets of medieval Siena, hosting both the University of Siena and the Academy of the Intronati. 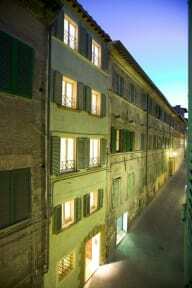 Campo Regio Relais is part of the Group Dimore D'Epoca Historical Fashion Houses. We offer luxury rooms equipped with all amenities and comforts, continental breakfast inclusive. The central position of Campo Regio Relais allows guests to easily reach the most important monuments of the city; the main square, Piazza del Campo, the Duomo, and the museums that house the masterpieces of Siennese art. On request and on payment you can park your car in a Garage, only a few minutes walk far from Campo Regio Relais. Campo Regio Relais is also perfect as a base from which you can discover the medieval towns and villages that surround Siena (Monteriggioni, San Gimignano, Volterra, Montalcino, Pienza, Montepulciano), explore the authentic countryside of the Chianti, Crete, and Val d'Orcia regions, or reach in a short time the cities of Florence, Pisa, Arezzo, and Lucca.